Pictured is Stephen O’Flaherty (second left), Chairman of Motor Distributors Limited, concessionaires for Mercedes-Benz in Ireland, and Niall Scott (centre left), Chairman of Sneem Digital Hub. 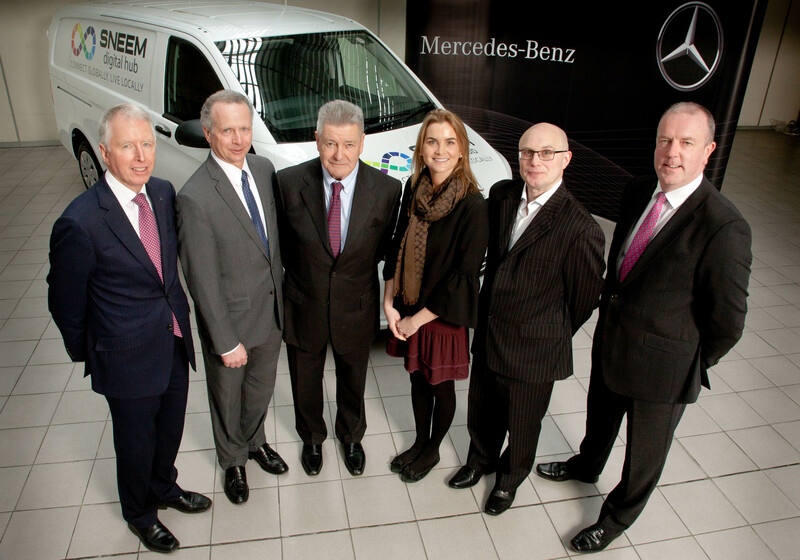 With them (left to right) is Stephen Byrne, Chief Executive, Mercedes-Benz in Ireland; Lauren O’Flaherty, Marketing Manager, MSL Motor Group; Aidan Murray, Manager, Sneem Digital Hub; and Fergus Conheady, Sales Manager, Mercedes-Benz commercial vehicles. Addressing guests present at a recent key presentation event held in the Mercedes-Benz headquarters on Dublin’s Naas Road, the company’s chairman, Stephen O’Flaherty praised the work being done by Sneem Digital Hub, seeing it as “a wonderful example of local enterprise at work in a way that brings immediate and downstream benefits to the community”.